I created my first complete RPG, Eaten Away, for the 2012 RPG Geek 24-Hour RPG Contest. It’s a pickup game of zombie horror, no prep required. I fleshed it out, decided it was perfect for a zombie horror game — which would also save me some time by sidestepping the need for setting material — and did most of the conceptualization in the car that morning. 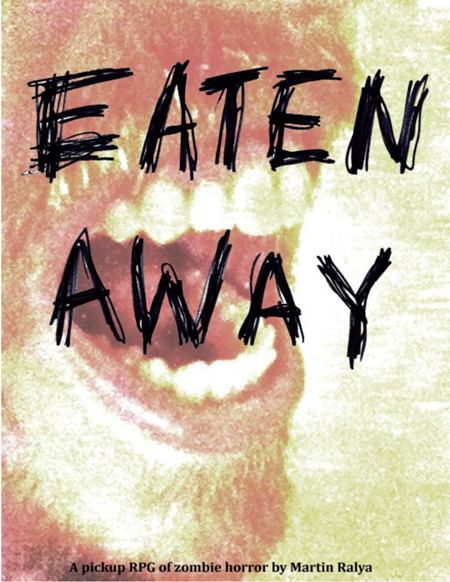 From idea to playable game, Eaten Away took me about 13 hours to create. Its inspirations include the countdown clock in John Wick’s Shotgun Diaries, the core mechanic in James V. West’s free RPG The Pool, the toolkit approach to setting creation in Eden Studios’ All Flesh Must Be Eaten, and the construction of free-form dice pools in Margaret Weis Productions’ Marvel Heroic Roleplaying, as well as the safe house concept and narrative arc in the video game Left 4 Dead. The setting and theme were inspired by a range of zombie movies and fiction, but especially by The Walking Dead — both the comic and the TV show, in slightly different ways. If that sounds appealing, you can download it as a free PDF.